Fit in a round of golf either before or after a special Father’s Day brunch from 9:00 am to 3:00 pm that includes everything from scrambled eggs, country potatoes, buttermilk pancakes and fresh fruit to corn on the cob, BBQ chicken and ribs and carved Tri-Tip. The Ivanhoe Course, which measures nearly 7,000 yards, and The Lakes Course, which is just under 6,600 yards, are both challenging and enjoyable layouts. 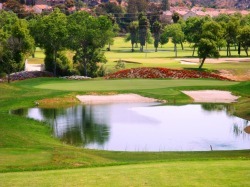 Although Ivanhoe is longer, it is easier to avoid trouble there than The Lakes, which lives up to its name with water coming into play at some point on more than half the holes. 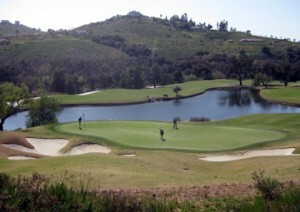 That includes the par-3 16th, which features an island green. The brunch is $19.99 for adults ($16.99 for seniors). Call 619-442-9891 (ext. 3) to make a reservation. Fathers staying at The Grand on Saturday or Sunday can take advantage of an offer to pay for 18 holes but play unlimited golf for the day. The special includes a custom club fitting and a complimentary logo golf hat. The Tom Fazio-designed course measures 7,160 yards at the tips and features rolling hills, lush surroundings and beautiful views, enough to make any golfer want to head right back out after putting out on the 18th. Or after a bite to eat, anyway. The Grand also will be featuring a three-course Sunday brunch ($45) from 10:00 am to 3:00 p.m. Room and golf reservations are available at 888-314-2030. Playing the Johnny Miller-designed course, which measures nearly 7,200 from the tips, is a reward in itself, but on Father’s Day there’s also a $25 gift card when dad and a guest play. A brunch ($32.95) with salads, a BBQ station and desserts is available from 11:00 am to 2:30 pm. If dad can’t make it to the course that day, then there’s the Ultimate Father’s Day gift package. It includes five one-on-one golf lessons with PGA pro John Darling, a custom driver fitting and a new TaylorMade R11 driver. Valued at $1,000, the package is priced at $499. Call the golf shop at 858-451-8100 for tee times or gifts. This entry was posted in Attractions, Golf & Sports, Insider Tips and tagged Cottonwood Golf Club, father's day, golf, Johnny Miller, Maderas Golf Club, The Grand at Del Mar, Tom Fazio by Kirk. Bookmark the permalink.